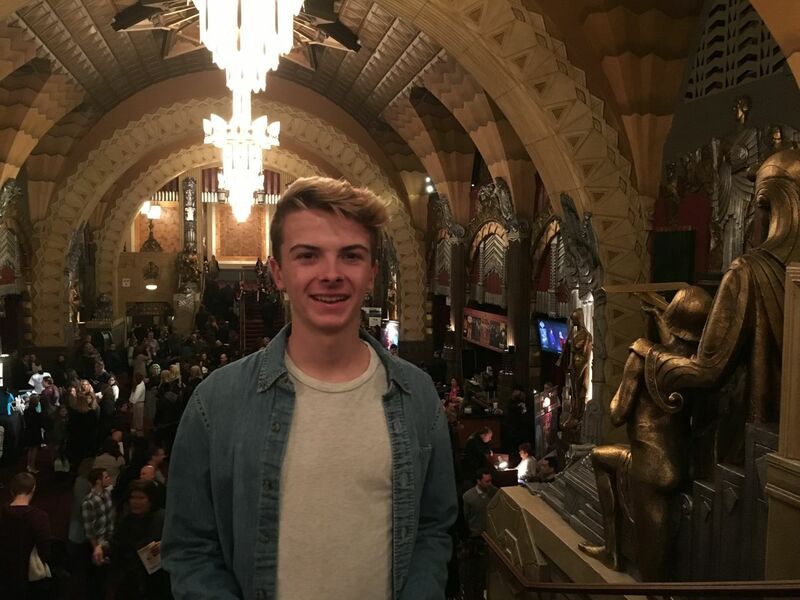 This past January, my son and I were back in Los Angeles for a father / son weekend to celebrate his 16th birthday. We took time to explore places he remembered from growing up in L.A. - and check out a few new things as well. 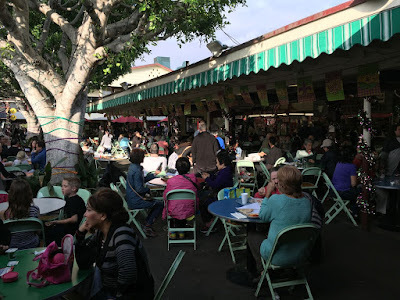 After time at the Santa Monica Pier, Third Street Promenade, and the Los Angeles County Museum of Art (LACMA), we walked - yes, people really do walk in Los Angeles - over to Farmer's Market. Farmer's Market, also known as "Original Farmer's Market," opened in 1934 on the corner of Third and Fairfax - about half a mile from LACMA. When we visited on a Saturday afternoon in late January - it was PACKED. Part of the reason is its location. 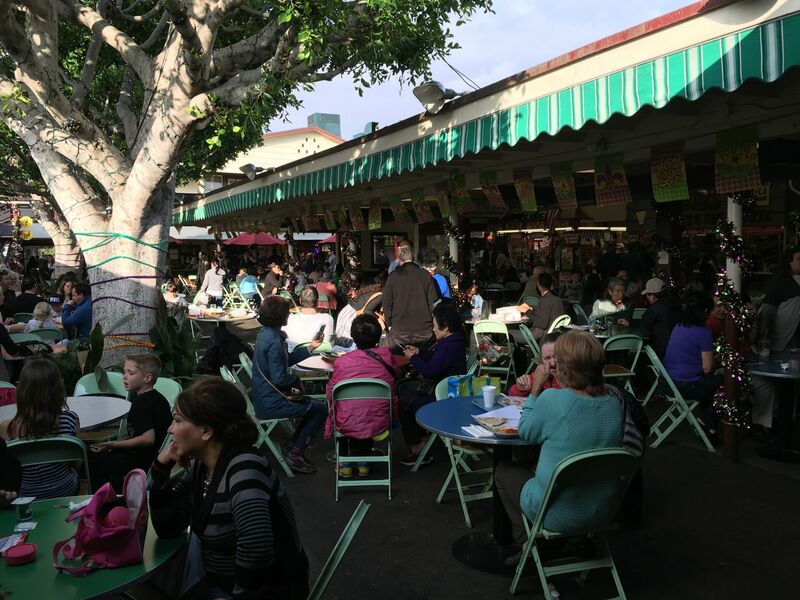 Farmer's Market is located immediately next to the jazzy, and VERY popular, The Grove outdoor shopping center. Walked around a bit, here's a link to a previous visit. 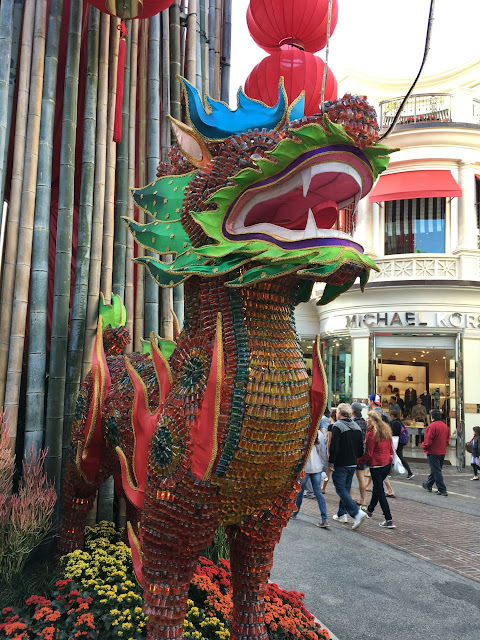 Above, a display honoring Chinese New Year. Back at Farmer's Market, there was a New Orleans style jazz ensemble. 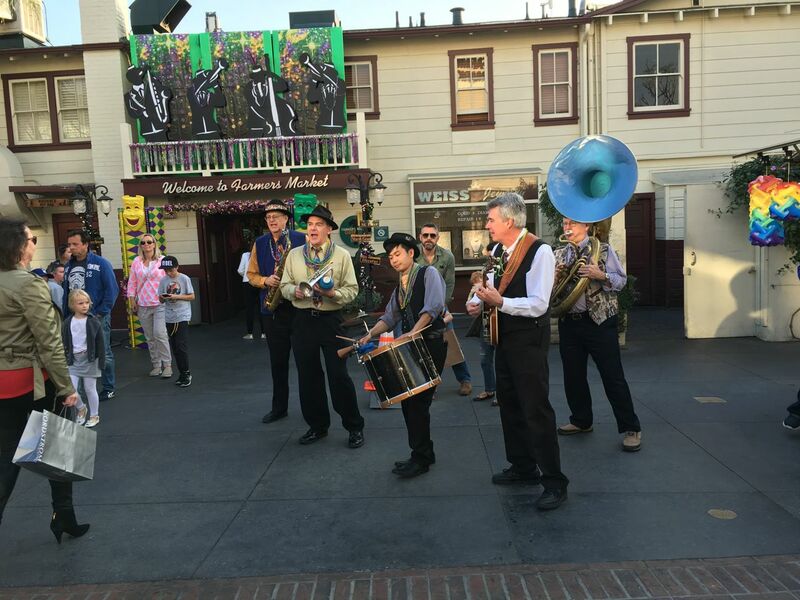 Think Disneyland's New Orleans Square, without the $105 ticket price (and, of course, without little stuff like Pirates of the Caribbean). Still, very fun. We headed over to our hotel in Hollywood, checked in to our hotel - the Days Inn on Sunset Blvd - and relaxed for a bit. 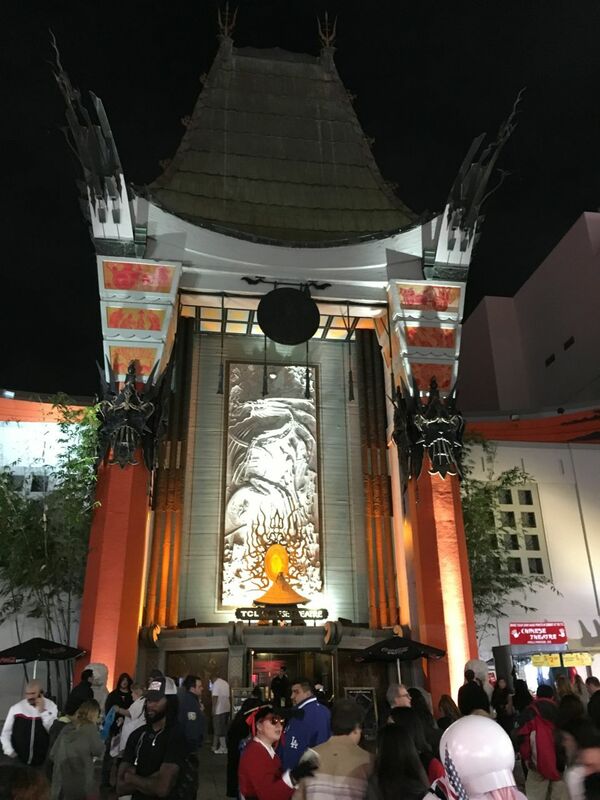 An hour or so later we walked over to the Hollywood and Highland complex for dinner - stopping off along the way at the Grauman's Chinese Theatre - technically the TCL Chinese Theaters. 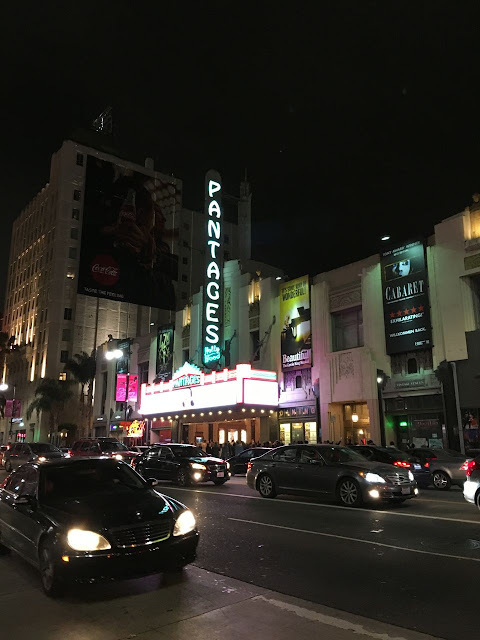 The theater opened as Grauman's in 1927 and is arguably the most famous movie theatre in the world. Looks good during the day - looks great at night. 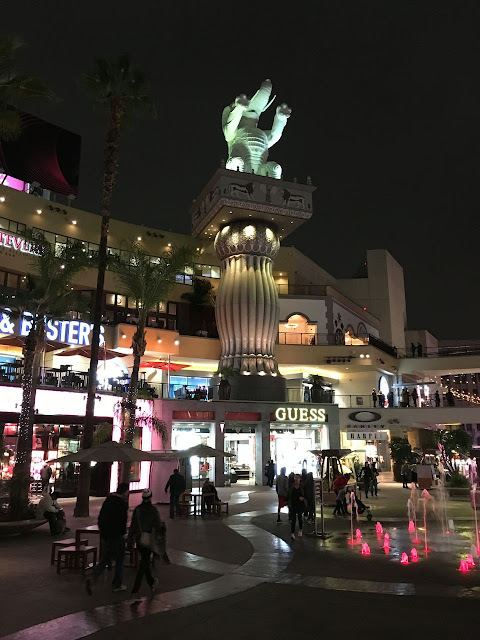 Hollywood and Highland is a three story outdoor shopping center located on the corner of (you guessed it) Hollywood Blvd and Highland Avenue. The GIANT elephants are designed to look like the set of silent film maker D. W. Griffith's 1915 epic "Intolerance" - which was Hollywood's first tourist attraction. 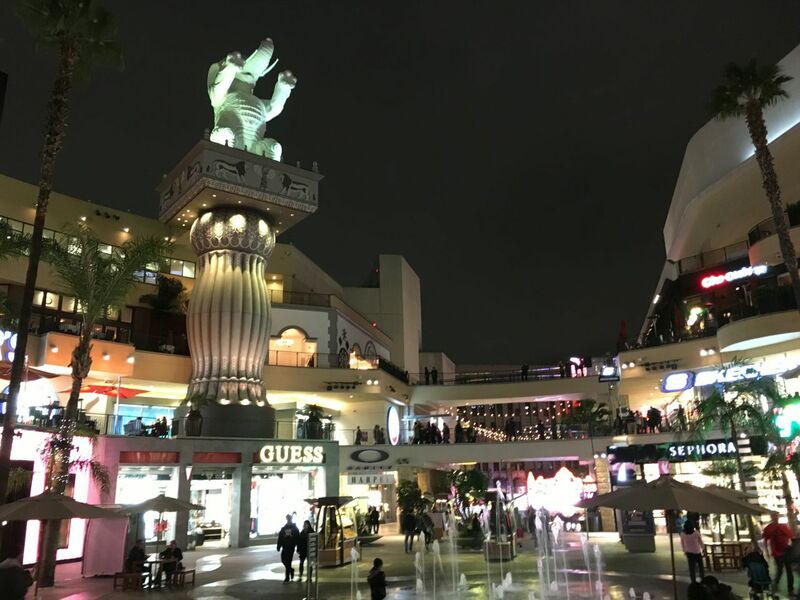 Another view of the Hollywood and Highland complex. We ate at the California Pizza Kitchen there (my son's choice). Most of the stores and restaurants are chains that can be found elsewhere. 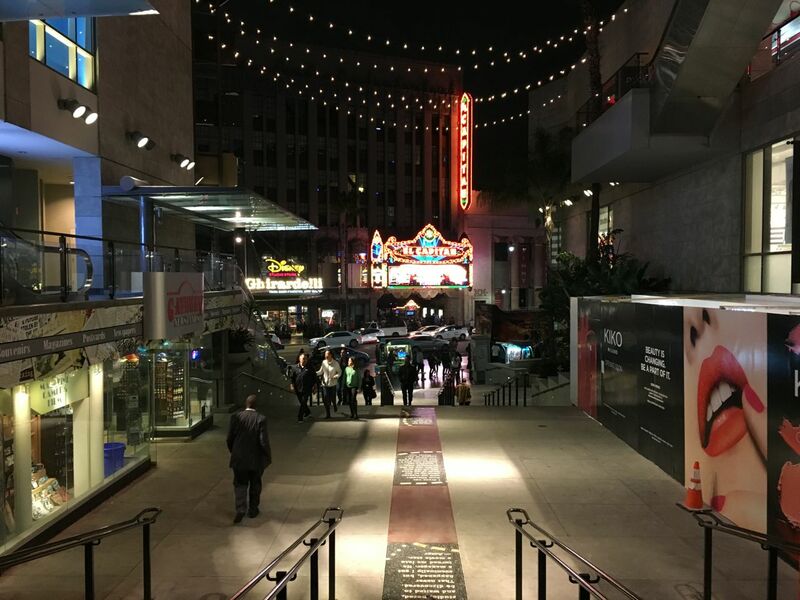 It's too bad Hollywood and Highland doesn't have something uniquely "Hollywood"- something that can't be found anywhere else. Something similar to NBC's "Today" show studio at Rockefeller Center in New York City. 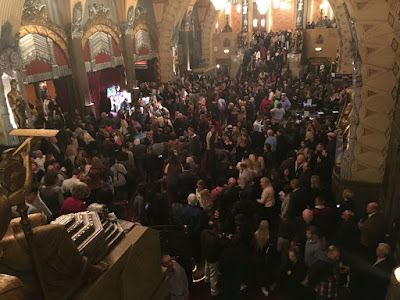 I'm always amazed at the crowds that gather every day there. I wonder why something like this couldn't something like this been an anchor. Another view of Hollywood and Highland - looking out towards Hollywood Blvd. The 1926 El Capitain theater. 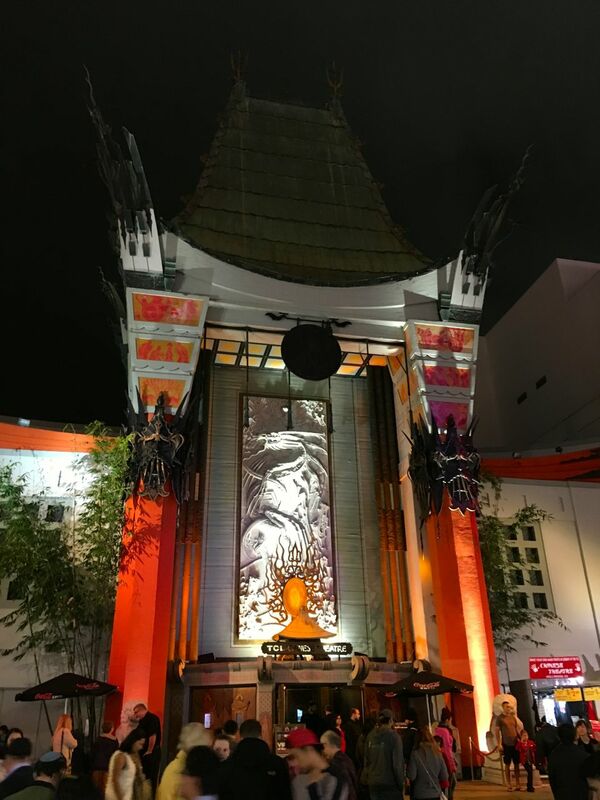 It was purchased by the Walt Disney Company back in the late 1980's who gave it a needed $14 million dollar renovation. 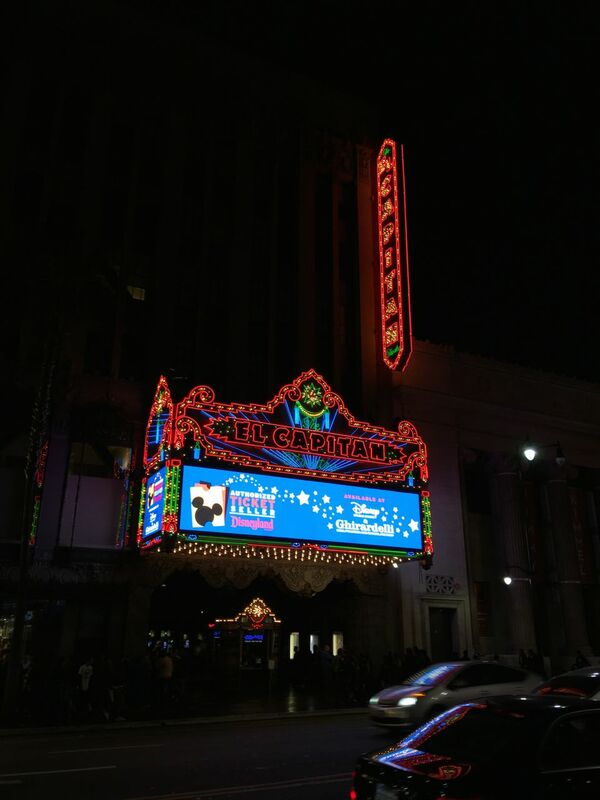 The theater reopened back in 1991 and serves as the flagship theater for Disney premiers and films. My wife and kids and I enjoyed the Disney film Oz the Great and Powerful here on a brief family vacation here in 2013. Walking back to our hotel on Sunset Blvd - the Chinese Theater was still crowded with visitors and tourists. My son and a bunch of his friends are all involved in the theater program at his High School - and he really and wanted to see a Broadway caliber show at the Pantages in Hollywood. 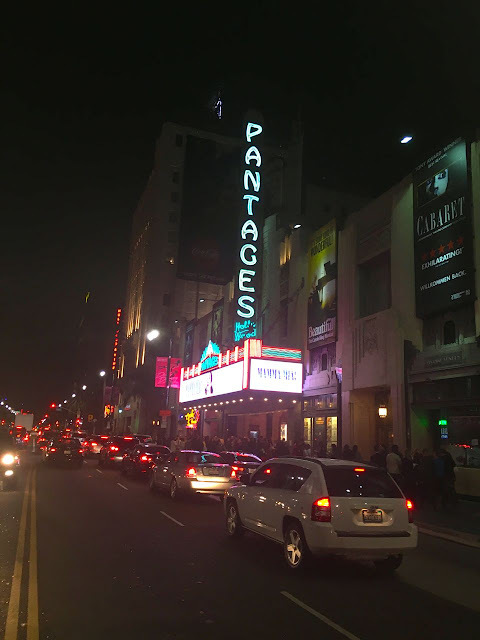 My wife and I had been to the Pantages a couple of times when we lived in Los Angeles (2005-2010). 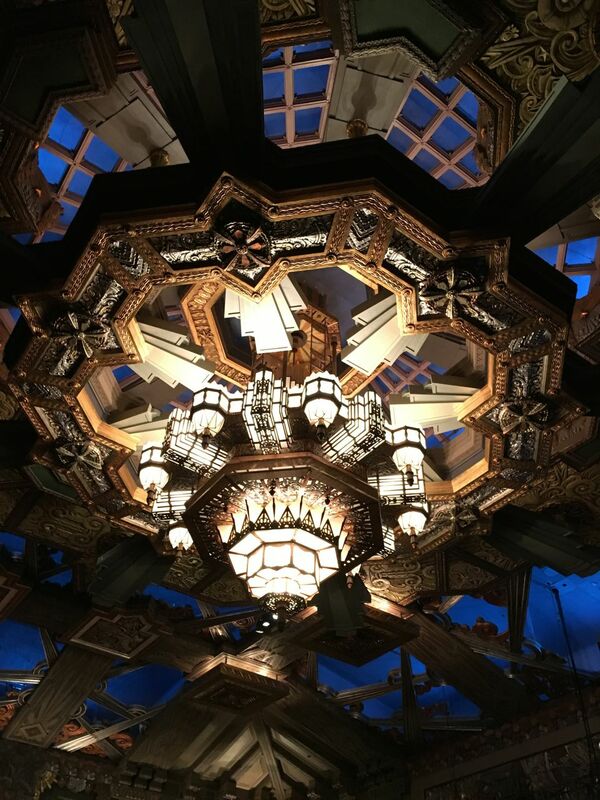 The ceiling inside the theater. The Pantages has a strict "no video/no photos" policy - so, sorry, no photos of the actual show. What did we see? What did I think about it? If I get some time this upcoming week, I'll come back and write about it ... and maybe even try my hand at a review (never as easy as it seems). 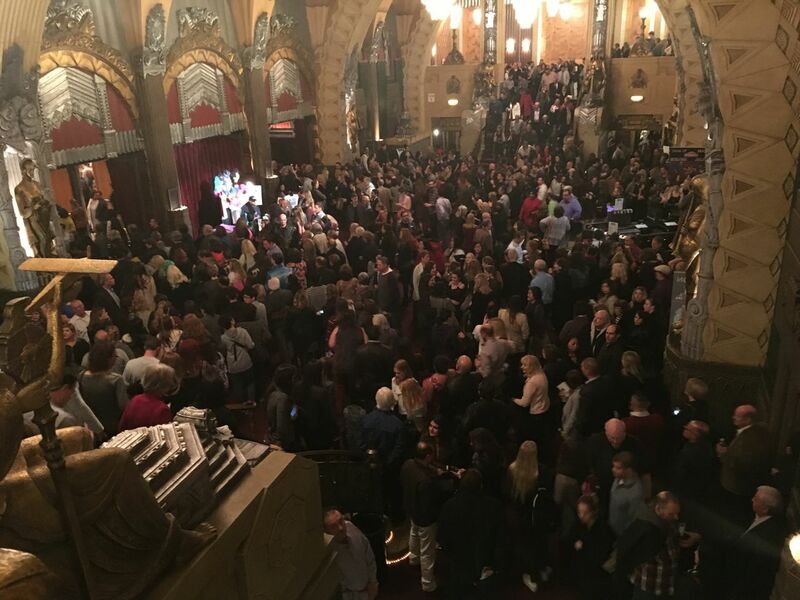 A packed lobby on the way out.